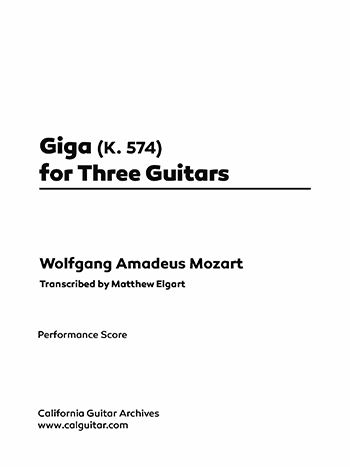 This short work—modest only in proportions—is an exceptional example of Mozart's attempts to integrate the complex Baroque contrapuntal techniques with that of the Classical era, a direct move away from what was perceived at the time as an antiquated and self-conscious body of work. The term itself, "baroque," means overly ornamented. Mozart, primarily through the works of Handel and Bach, sought in the latter years of his life to meld the contrapuntal complexities of the Baroque with the current ethos of the classical era. This transcription for three guitars provides an ideal setting for the work's complexity and independence of voices.